I was working on my social media analytics book yesterday (BTW, you can grab the first chapter free) when I came across this statement by Wes Nichols in an Analytics Magazine article from last fall. 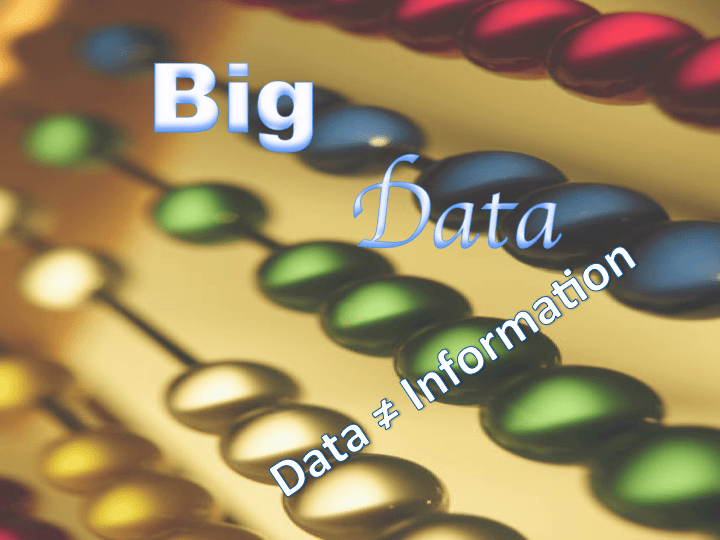 Big Data without the right math-based analytics is a Big Problem. The “right” analytics are essential to bringing big data to life for marketing organizations, thus allowing for faster insights and better decision-making. He goes on to say something really profound: data doesn’t equal information. And, that’s really the problem — making sense of social media data. In the world of traditional media, we just didn’t have good data. And, maybe that’s why marketers never developed the tools for analyzing the results of their marketing campaigns. There just isn’t much to analyze after spending $4 million on a Super Bowl ad — it ran, a bunch of people saw it, end of story. With social media, the problem isn’t not having any data, it’s having too much data and not having adequate tools for developing understanding. Sure, some great SAAS solutions are available to transform massive amounts of data into nice visualizations, but do those data visualizations provide the necessary insights to guide marketing decision-making? According to Wes, the answer has to be NO. And I agree. Sure, you get some great information about how many people clicked on your content, how they moved down the conversion funnel on your site, and where they came from, but don’t you want to know more? Why did they buy your brand? Will they recommend it to their “friends” on social networks? Will they become an advocate for your brand — often called a brand evangelist. How did they initially discover your brand? What will they want next? And, the list of unknowns goes on. Even with the most expensive, most sophisticated tools out there, you’re still in the dark somewhat. Unfortunately, according to IBM, only about 20% of digital data is quantitative, leaving the vast majority of digital data in qualitative form — the words, images, and videos becoming ubiquitous on social networks. While quantitative data is great for answering tactical questions, like A/B tests of which headline or CTA delivers best or what time to post on a particular social network to optimize ROI, they’re really bad at answering strategic questions such as those posed above. To answer questions regarding why consumers did what they did and what they’ll do in the future, you need qualitative data. In social media analytics we make the distinction between tactical monitoring using social media metrics and listening, which involves developing strategic insights from digital communications. And, therein lies the problem. I’ve evaluated a vast number of tools designed to glean insights from qualitative data using a combination of artificial intelligence and semantic reasoning and I’ve yet to see one that comes close to providing the insights available through human analysis. Let me reiterate this point because it’s incredibly important. Strategic insights require analysis of qualitative data, not just quantitative data. Maybe an example will help. My book co-author, Mark Eduljee, is a Program Manager at Microsoft. Part of his role is developing social media analytics from digital messages, often called social listening or simply listening. He tells the story surrounding introduction of the Microsoft Surface computer — the first computer device sold by Microsoft. He spent the next couple of days listening to chatter about the Surface across social networks, blogs, and news sites. He quickly uncovered strategic insights that guided development of the next generation Surface to solve problems identified through digital communication on these sites. He also has a hilarious story about a problem called into the Microsoft help desk. If you run into him, get him to tell you the story. Listening is really great for answering strategic questions about what motivated purchase, what consumers like and don’t like about your brand, how the product fits into their lives, and deeper cultural meanings that frame purchase decisions. A second problem resulting in poor social media analytics insights arises because we lack the mathematical tools to aid in analysis. Again, this results in good tactical understanding, but poor strategic marketing insights. Here I refer mostly to modelling, an area where marketing falls way behind its academic cousin, economics. Modelling builds on deep understandings of how and why consumers do what they do. A marketing example of a model comes from Fishbein and Ajzen who show how consumers buy based on both attitudes toward the brand and cultural norms governing appropriate behavior. Marketing models seek deeper understanding of consumer behavior that exceed individual metrics. But, we don’t have enough of them and many, like Fishbein and Ajzen, haven’t made it past academic inquiry to be used in marketing practice. And, we have a real deficiency of models explaining digital marketing and the one exception, deals mainly with digital use, not social media analytics. To counter this deficiency, I developed the 4-factor model to assess overall social media performance. Now, I’m the first to say this model isn’t perfect. But, it’s a good starting point for further discussion and development. One major failure of the model is it only explains 1 element important for social media analytics — performance. It predicts sales and is; therefore, an important element for forecasting and planning which makes it strategic not tactical. It also points to elements impacting sales, so it goes beyond vanity metrics, including likes and follows. So, what do you think about making social media analytics more strategic, not that tactical insights aren’t important? Any notions on my 4-factor model of social media performance or ideas for other social media models that might provide better strategic insights to guide decision-making? Whether you need a complete content marketing strategy or a complete metrics-driven social media strategy, we can fill your digital marketing funnel. We can help you do your own social media marketing better or do it for you with our community managers, strategists, and account executives. You can request a FREE introductory meeting or sign up for my email newsletter to learn more about social media marketing.